Laughing at me ? looking at the title? thinking Jagruti has gone crazy..:D ! I know must be you are thinking she is promoting Vidya Balan's Dirty Pictures :-P hahaha..well let me tell you No I am not, but hey I really enjoyed that movie and Vidya's work..she won the National award too ! well done Dirty Pictures team..Congratulations ! A very happy b'day papa !! 2nd we are celebrating today festival of colours Holi..wishing everyone a very happy and safe Holi !! and 3rd is us women celebrating women's day !! proud to be a woman and wishing every woman in the world a very happy women's day !! A woman is an epitome of grace beauty, love, power, generosity, affection...she is symbolic of strength. She is driven by emotions but she has a heart that feels for others so selflessly and unconditionally. She cries but there is pain, anger and frustration in those tears. Still those tears are not her weakness...they show her endurance and tolerance.Her silence speaks volumes for her patience. Don’t test it because when that silence breaks and that lava erupts. Its heat can melt all those chauvinists and burn them to ashes. Don't underestimate the strength of a woman. She may be portrayed as weak, but she can carry a child in her womb. She may look vulnerable, but she can weather a storm. A woman can multi-task as a mother, wife, worker, friend, and daughter, without missing a beat. "Its a challenge to be a "woman" because within that role they have more different roles. Cheers to all the women in the world. Lets sa...lute each other for being so strong and yet so caring. Let’s celebrate International Women's Week "
Place all the ingredients in one bowl for malpua except ghee and make smooth batter. Leave it a side for minimum 1 hour. To make sugar syrup place sugar and water in a pan and boil on a medium heat. Simmer for 5-6 minutes and make a one thread chasni. Turn off the heat, leave chasni aside. Heat ghee in a shallow frying pan on a edium heat ( flat bottom pan ) , upto 1/3 it's depth. When ghee is hot, add one tbsp of batter in the pan. cook one side and flip carefully with perforated spoon and tongs.Fry the other side till the malpua is golden brown. Drop the malpua in hot sugar syrup and drain the malpua and garnish with silverd pistachio and almonds with Rabdi. Place milk to boil in a heavy bottom pan or kadai, stirring continuously. When starts boiling , lower the heat and keep stirring till milk is in 2/3 in volume. Now add sugar and masala and cook thickend milk further 5-6 minutes. Cool to room temprature and chill. Wow - Looks great. Never made malpua. I love the photographs Jagruti. They look so fantastic with the holi colours. looks real great love that dollop of rabdi on top. happy holi to you too. the pics are so tempting Jagruti!...i would love to take a bite!...Happy Holi! Awesome malpuas... I am drooling here. Have to find a place that sells this. Bye bye My dear diet I will miss you. Really Diet, It's all Jags fault. Love the pictures. Absolutely love malpua. 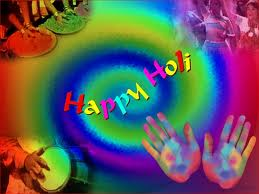 Happy Holi.